The NYSE-listed media company behind two top U.S wedding websites -- WeddingChannel.com and TheKnot.com -- recently held a survey of more than 17,500 brides who got married in 2012. Although the survey only covers the United States, some of the stats revealed offer some interesting insights, especially for couples considering a cost-effective but magical destination wedding. 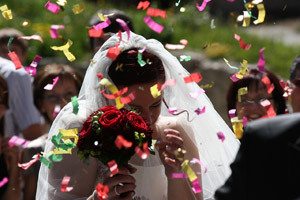 The cost of a wedding varies greatly depending on the location chosen. In the US this ranges from an US$15,504 average in Alaska to US$76,678 average in Manhattan. The average wedding budget nationwide in 2012 was US$28,427 (slightly higher than 2011's average of US$27,021), and this is excluding honeymoon preparations. Of this budget, the highest portion is generally allocated to the wedding venue and reception hall (45%). The engagement ring takes up approximately 19.11%, while rounding up the top five relative expenses are the band (10.85% / US$3,084), photographer (8.37% / US$2,379), and florist/decor (7.03% / US$1,997). Shining a light on wedding decor trends, a third of weddings surveyed last year had a blue colour theme, with purple, green, and metallics also popular. Other trends identified in the survey included an increasing focus on guest entertainment, and a less formal, more "fun" style for many weddings. Interestingly, nearly a quarter of respondents opted for a destination wedding, although the survey does not identify whether they chose international or domestic destinations. In addition, while in 2012 overall wedding expenditures crept up less than 5% compared to the year before, another survey revealed that guests attending a wedding in the US are expected to spend 59% more this year than last. American Express Spending & Saving Tracker also looks at the cost of a wedding in the United States, but the research focuses on an often ignored side of the event -- how much you, as a guest, should expect to shell out per wedding. The largest expenses (averaged for a typical wedding) include dressing up, hotel stays, transportation, arrangements for the children, and other costs associated with just attending a wedding. Then there's the estimated average wedding gift spend, which is not included in the overall expenses, and ranges from US$97 for a friend to US$144 for a family or relative. Interestingly, the more affluent group of respondents questioned, indicated US$251 for both a friend and a family member. Wedding gift preferences have also been studied, comparing what guests give versus what couples really want. The most commonly given gift is one purchased from the couple's registry (35% of respondents), followed by cash (32%) and a gift card (14%). From the bride and groom's side, 52% of couples prefer cash, with only 18% preferring a gift registry present.